Comfortable, newly furnished and decorated studio apartment for two on the western fringe of town, only 2 minutes walk from all amenities. 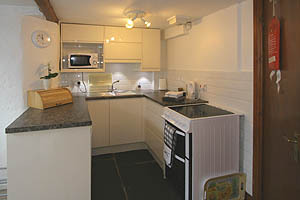 Studio is self-contained in the basement, with use of patio with superb views shared with the owners. 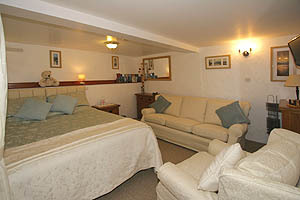 The living/bedroom area is cosy and inviting, with a king size bed (which can be split into two singles), settee, armchair, TV with DVD player, selection of books, games and DVDs. There is a built in wardrobe. Adjoining the living room is a dining area and newly fitted small kitchen, equipped with electric cooker, microwave, fridge, toaster etc. 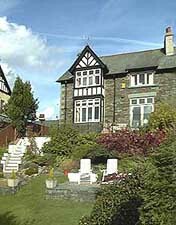 Central heating, hot water and electricity are included, also towels and bed linen. 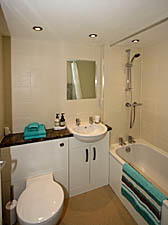 The bathroom has shower over the bath, with further built-in cupboard space opposite. Towels are provided. A Sauna is also available at a small charge. From £250 to £380 per week according to season. Short breaks available out of season. 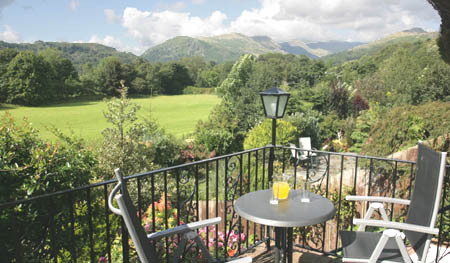 For further information and bookings please see our website or phone 015394 31700 or email info@riversideambleside.com. Please note that the apartment is strictly non-smoking.